Ai Weiwei’s visit to Britain for the opening of his show at the Royal Academy will be brief. 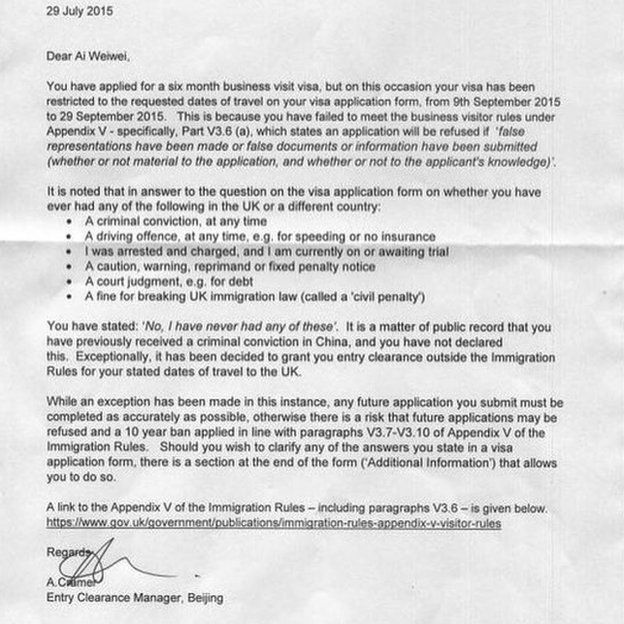 The British Embassy in Beijing has written to the artist, turning down his application for a six-month ‘business visitor’ visa. Instead, it will only grant him permission for the travel dates he has requested, citing his failure to declare ‘a criminal conviction in China’. It’s hard to see what the British Embassy’s entry clearance manager means by this – although Ai Weiwei was detained for 81 days in 2011, he was never charged or convicted of a crime. The artist says that his attempts to make this clear to the UK Visas and Immigration Department and to the British Embassy in Beijing have so far fallen on deaf ears. The letter from the British Embassy in Beijing.